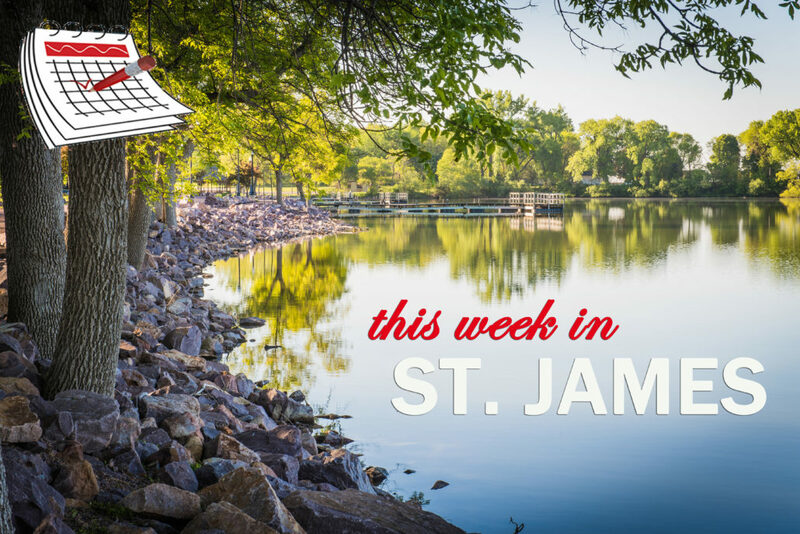 This week in St. James Monday Evening Storytime at 5:30 p.m. Tuesday, Breakfast with Moms 7:30 a.m. – 8:30 a.m. Eagle’s Taco Tuesday 5 p.m. – 7 p.m. Thursday VFW Hamburger Night 5 p.m. – 7:30 p.m. and James Gang Fastpitch Summer Lead Meeting 6 p.m. – 8 p.m. and Novels By Night 7 p.m. Friday, Friday Flicks 1 p.m. and Eagle Fish Fry 5 p.m. – 7:30 p.m. Saturday, Cribbage and Cocoa 10 a.m. Freeze Your Caboose Off 9:30 a.m. – 11 a.m. Chili Feed 5 p.m. – 8 p.m. and Fat City All-Stars 8:30 p.m. – 12:30 a.m. Sunday, Permit to Carry renewal class. Check out the community calendar for more details on these and other upcoming events.